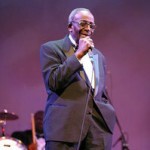 June 24, 2008 Ira Tucker, Sr., lead singer for the Dixie Hummingbirds, died. Tucker was born May 17, 1925 in Spartanburg, South Carolina. He joined the Hummingbirds in 1938 at the age of 13. In addition to his vocal skills, Tucker introduced energetic showmanship, including running through the aisles, jumping off the stage, and falling to his knees. Tucker performed with the group for 70 years, right up until his death. The Dixie Hummingbirds won Grammy Awards for Best Soul Gospel Performance in 1973 for “Loves Me like a Rock” and Best Traditional Gospel Album in 2007 for “Still Keeping It Real.” Their 1946 recording of “Amazing Grace” was inducted into the Grammy Hall of Fame in 2000 as a recording of “qualitative or historical significance.” The group was inducted into the Vocal Group Hall of Fame in 2000 and the Christian Music Hall of Fame in 2007.